Sylvalla escapes Avondale castle, and the life of a princess, in search of the adventure she’s always wanted. Once found, adventure bites back. Fortunately Sylvalla is not alone – Unfortunately, her new-found companions are less than heroic. Jonathan would rather make money. Dirk would rather live a long and happy life. And at 150, Old Capro would rather stop gallivanting about and harangue unsuspecting wizard students about his glory days over a nice cup of tea. 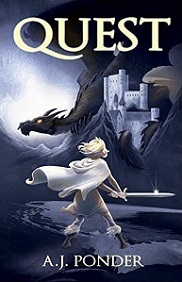 Quest has everything, heroes, monsters, chases, escapes and a complete lack of true love.